My mother was, and remains, a Latin teacher, and Latin was, and remains a common point of interest between her and my father, who were both classics majors and met at the classics booth on my mother’s first day of shopping classes (my father was the booth boy, and my mother took the bait, at least for 16 years). Defiantly, I took French, and later, Spanish, and later still, Arabic and Italian, and never managed to absorb more than a few phrases of Latin, the main one being puer molestus, or “annoying boy,” which my mother, a teacher of teenagers, had many occasions to utter. Latin has been a peripheral item in my life, but it was tremendously important in the lives of early non-native Americans. 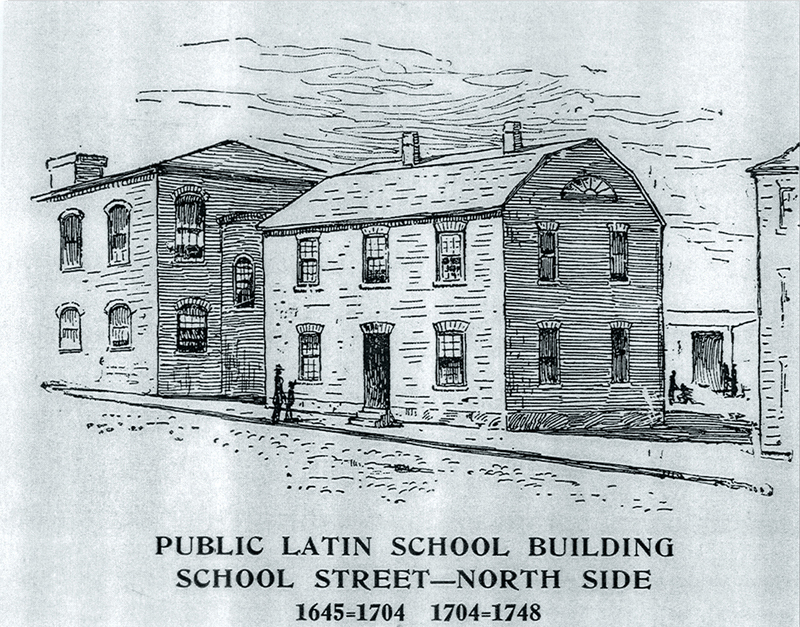 In the Massachusetts Bay colony, English was the langue franca, but Latin was the lingua eruditum, language of official documents, and the men of God (and lucre) who wrote and received them. Thus, education, when it arrived in Massachusetts, was theological, and heavy on Latin. It was also, at the younger levels, open to all (men), regardless of class, and supported by taxes levied on the area public — and in these traits, it was revolutionary. 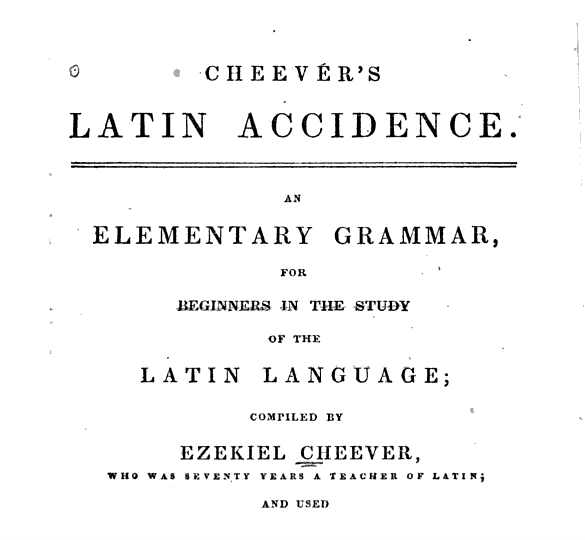 Accidence was published in 1708, and became the standardized Latin textbook for one and a half centuries. As someone who doesn’t read Latin, I’m not the best person to judge its efficacy, but the English excerpts I’ve read are clear and concise. Cheever’s definitions of nouns and verbs could well be used in English class today. To me, the most curious thing about Accidence is its title. “Accidence” is not a word I often run across, and it has two meanings that are quite different from its’ common cousin’s: the philosophical “non-essential or incidental characteristic,” and the grammatical “part of grammar dealing with inflections.” The latter seems to be the likelier source: inflections are the changes in word form for the expression of tense, person, case etc, and would be a subject of constant coverage by a Latin teacher, particularly one who made heavy use of oral repetition. Why our “accident” and Cheever’s “accidence,” which share the same root, ad – “to” + cadere – “fall”, have such different definitions is unclear to me, but the latter’s grammatical meaning came about in the 15th century, far after the former, which made its way into France in the 12th century, from the Latin accidentem. At any rate, Cheever, or Mr. Williams, appear to be the sole employers of “accidence” as a textbook title. Do you remember much from any of your old textbooks? I remember the renderings of different porto-men in my sixth grade social studies textbook, and that’s about it. But Accidence had weight: it was likely the only textbook in many primary school classrooms for decades, until the popularity of Latin began to wane and make room for other subjects. 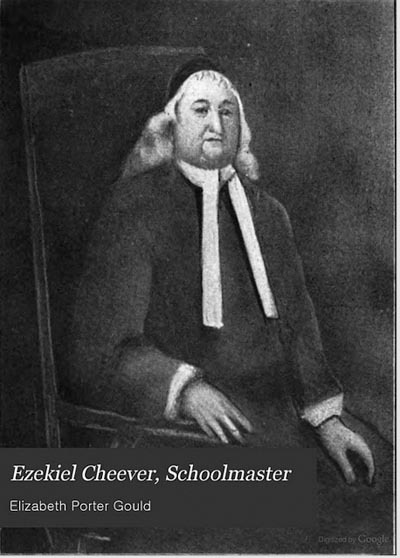 In his eulogy for Cheever, Cotton Mather wrote “Master of Sentences, he gave us more/The(n) we in Our Sententiae had before.” Accidence was a dead-tree piece of that, but it gave life to years of early scholarship on par with the motherland’s, and when it came time to break away, that scholarship helped us run.